Istria – The New Tuscany. Rightly so. 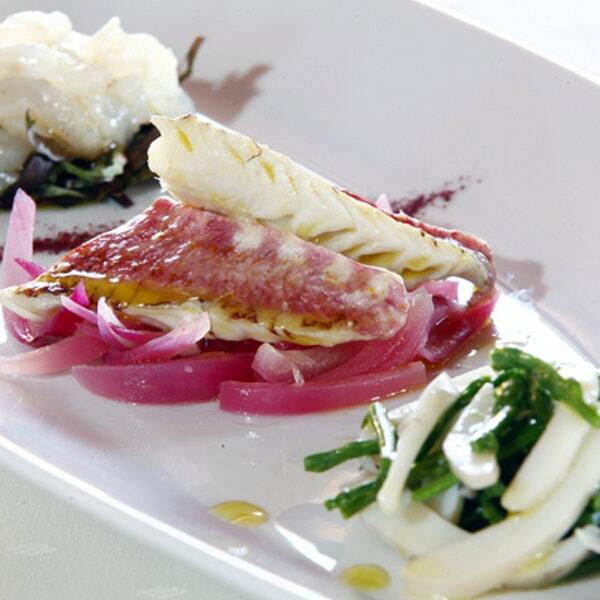 Istrian food has rich culinary traditions which are passed down through each generation. 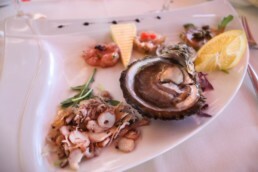 Istria, in the north of Croatia, is already hailed as the new Tuscany for foodie travelers. In the place where foraging for wild asparagus and herbs is considered a local pastime, people make delicious sparkling wine as a hobby and everyone seems to have an allotment patch in even the tiniest of gardens, it’s safe to say people understand local ingredients. World-class olive oil, prosciutto crudo and seafood. Yet, truffle is the king! And proudly cherished grandmother’s recipes. Don’t ever tell a Croatian that their fuži pasta looks like penne, penne is rolled on the diagonal and fuži is rolled symetrically from corner to corner. Small but significant difference. You could make this dish with readymade pasta, but if you’re spending a little £$€ on truffles then it is worth making the pasta yourself. Readymade just doesn’t compare with homemade pasta and it’s really really really not difficult to make. There is another Istrian fuži dish which uses samphire. I am absolutely obsessed with samphire, which for those of you who haven’t experienced the pleasure of tasting it is a wild coastal rock asparagus which tastes of heaven. It is however highly seasonal, and even in July and August when it is traditionally harvested you won’t be guaranteed to find any in the supermarkets. Whenever I spot it in Sainsburys, which is hardly ever, I buy as many packets as I can. I will cook the samphire version the next time I find some. Slice the garlic clove in half and rub the base of a large saucepan, add the butter and heat on medium until melted. Finely grate half of the truffle and add to the melted butter, heat gently for 1 minute. Slowly stir in the cream and simmer for 10 minutes. Remove from the heat, cover and leave for a minimum of 2 hours for the truffle to infuse properly. Roll your dough through your pasta machine, working down through the settings until it is about 1.4mm thick, on my machine this is number 5 the second to thinnest setting. Cut your pasta into squares 5cm by 5cm and starting with a corner wrap each piece around the back of wooden spoons or some wooden dowling of approximately 1.5cm in diametre. I allowed mine to dry overnight before removing and cooking them but you can cook them straight away if you please. 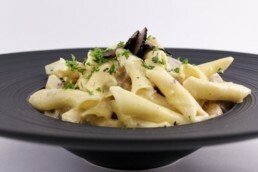 When ready to eat, gently heat the truffle sauce and season to taste. Cook the pasta in boiling water for 2-3 minutes until it is al dente. Stir the sauce into the pasta, and plate up. Shave the rest of the truffle and the parmesan on top and enjoy. Boskarin is the white grey long horned cattle in Istria, a symbol of the region. It was used in agriculture, to plough the fields, but also stone towing and house building. Its meat and milk were used by farmers as food. Today,Boskarin is hailed as a true gourmet delicacy in Istria, its meat being back into the gourmet cuisine of the region. The traditional cuisine and recipes are taking on a new note. Boškarin is served at top restaurants and konobas (taverns) in a variety of ways, including as carpaccio; in savoury sauce with pasta or gnocchi; as salami or steak; and boškarin tail soup. Whether you’re looking for a haute-cuisine restaurant or an informal village inn, Istria seafood standards are high and ingredients first class. There’s nothing better than fresh seafood, and you can’t get any fresher than straight from the sea. The Limski Kanal or Lim Channel or fjord as it’s also known has a low salinity which makes it perfect for oyster and mussel farming. While oysters can be prepared in a variety of ways, eating them raw is most delicious. It simply has to be opened with a special knife and perhaps only dressed with a few drops of lemon juice. Fresh cold oysters are a perfect match for champagne and sparkling wines, however, they also go very well with Istrian Chardonnay. Oysters are tastiest in winter. Scampi is available throughout the year, but at its best in May, June, and July. The most successful hauls are often at nights with a full moon. Its habitat is in the channels of the northern Adriatic, particularly in Istria’s Kvarner Bay from Zadar to Novigrad, Rijeka and Cape Kamenjak. For this reason, it is often called the Kvarner crab. It is equally tasty boiled, grilled, prepared in sauce, wrapped with Istrian ham, roasted on a spit, breaded, marinated, and – in the latest fashion – raw with a few drops of excellent Istrian olive oil. The western Istrian coast, especially near the mouth of the Mirna River, is well-known for top quality scallops. Scallops can be found in Istria year-round but considered at their best during the winter months. Typical preparations include boiling, grilling, and broiling, as well as raw. 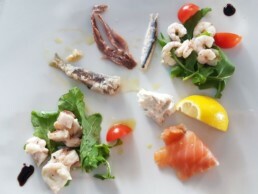 Salted anchovies are a real specialty of this territory, whose original recipe has remained the same since ancient times. Salted anchovies are prepared only with fresh fish that is stored in wooden barrels and sprinkled with coarse sea salt and kept there for a few months. When the fish is extracted it is dipped in olive oil. Juicy Istrian fish stew, once the dish of poor fishermen and today a delicacy is an irresistible combination of different marine species in one pot. Served with yellow polenta and homemade bread, it is a real feast for the senses.